These unique kits contain everything you need to construct a Chod leader or helicopter presentation on your desired leader. 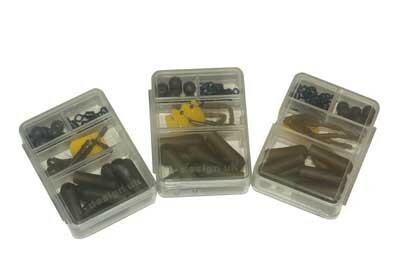 Supplied in a handy i-design box, the kits come with Grip Stops, Top beads, Ring Swivels and Chod Buffers. Looking to buy some Stops, Beads, Sleeves, Tubing as part of a fishing gift? If you would like some advice on purchasing Stops, Beads, Sleeves, Tubing, simply contact our expert fishing team, giving us either an email or phone number on which to contact you and we'll get back to you right away with the best advice and prices. FREE Delivery on all Avid Stops, Beads, Sleeves, Tubing over £100!! !